D Ring, bolt on, 1/2". Great for adding another tie down point to carrier beds. Short strap with sewn loop that goes with the rollback tie down system. 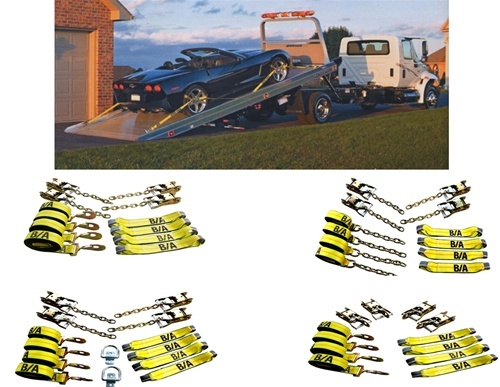 8 Point Tie Down System for Tow Trucks / Car Carriers With Key Slots, Works Great on Jerr Dan and Miller Flat Beds. 8 Point Tie Down System includes D-rings. Great for the towing and transport industry. Secure vehicle on deck by all four tires. 4 ratchets with chain for keyslots. 4 long straps with J-hook ends for center D-Rings (not included). 4 tire snugging loops. Great tie down system for carriers and trailers.